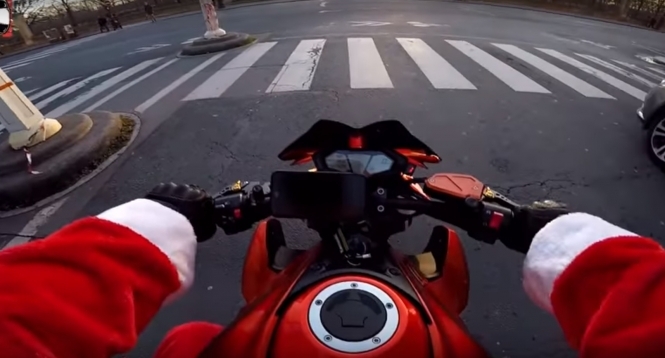 The star, known as CHRIS-RS on YouTube with over 65,000 subscribers, was already filming a comedy video dressed as Father Christmas on a motorbike, when a driver on a crossroads in Paris ran a red light, hit an elderly pedestrian who was crossing the road, and then continued driving. The victim was said to be an older woman, walking with a cane. The YouTuber, taking advantage of the fact that he had not only seen the accident, but had also filmed it, and was riding a fast motorbike, took after the car, and tried to get it to stop by signalling and driving in front of it. Despite the Paris traffic, however, the car - a black Renault Clio - continued to try and escape, forcing “Father Christmas” to get back on his bike several times to continue the chase. The driver - whose windscreen had even been damaged in the offence - comes to a halt a couple of times, but each time decides to drive off once again, weaving through traffic and at one point even driving on the wrong side of the road to get away. Even when the YouTuber manages to explain the situation to two Policemen on motorbikes, the driver continues to attempt to drive away, forcing the police to put on their sirens and take chase. The perpetrator was eventually caught by the police - while filming was still taking place - and arrested, after a six-minute chase. The driver only calmed down enough to let the police arrest her once one officer had threatened her with a firearm. The video of the incident - which is just over 13 minutes’ long - now has almost 1,500,000 views, with many comments viewers congratulating the star over his actions. In a notice just before the video starts, CHRIS-RS warns viewers that it is intended to show “what not to do”, and that “not stopping after an accident is an offence”. He explains that it is important to actually stop someone after a hit-and-run incident, rather than only take note of the licence plate, because the driver may not be the owner of the car. “When I got up this morning, I did not imagine I would be doing this,” he adds at the end of the video, while following the Police bikes after the incident. Spectators gathered at the final scene, remarking on the unexpected comedy spectacle of seeing “Father Christmas” turned justice warrior, including “"Père Noël justicier" (Vigilante Father Christmas) and "Monsieur le Père Noël, ça mérite un selfie ça!" (Mr Father Christmas, that deserves a ‘selfie’!). This is not the first hit-and-run the YouTuber has helped - in October in the Bois-de-Boulogne, he reportedly raced after a car that had allegedly run down a scooter, according to news source Europe 1.